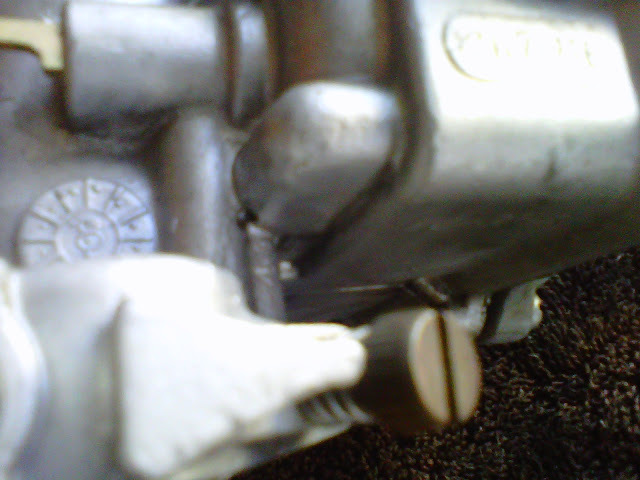 Check it: Small hole in carb leaks gas when acc. pump is cycled and a slow weep at idle. does this mean a accelerator pump seal is bad or check ball? Squirts out like a pump shooter when cycled. more so on the return stroke. DANGEROUS leak, can not run like this and it has be mobile by Thursday. Help me A-Body - wan, your my only hope! looks like the Acc. Pump diaphragm is leaking and it is supposed to weep out this hole when bad, unsafe design, but whatever. Info was buried under all the leaking fuel bowl gasket threads. Now I know. If we sealed the hole already and run a good diaphragm, not love loss, right? Just no indicator I hope. I think you'll need that hole open to get the acc pump to work correctly. If it's sealed tight, the diaphram won't move like it should. Put in a good quality kit and check for leaks now and then. I guess if you were really worried about it you could drill and tab that hole for a fitting and then run a tube up into the air cleaner so fumes and/or gasoline will be routed there instead of dripping down toward the exhaust. I'd be more worried about bowl leaks with a 1920.